- 0% deposit on Bathroom and Boiler Finance. - No penalties for early repayment. - Borrow between £250 and £25k. Designed to meet your individual needs and specification, your bespoke bathroom or wet room will be a stunning addition to your home. Whether you want to upgrade your existing boiler by purchasing a new replacement or it is in need of repairs, contact our boiler experts. Prevent a build-up of sludge from causing your central heating system to fail by scheduling a power flush from Holloway Bathrooms. Contact our plumbers now, in Surrey, for more information about our bespoke bathrooms. No matter if you need reliable plumbers to repair a leak or heating engineers to install a new boiler, our team in Ash, Surrey, have the skills to get the job done. 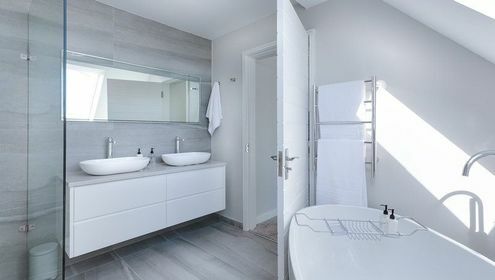 Holloway Bathrooms was first established in 2014 as a one-man team with the vision of becoming an extensive, well-known, and trusted company that offers plumbing and heating services all over Surrey and Hampshire. Now, in 2018, we are almost 10 times the size as a company, and specialise in designing and installing bathrooms and wet rooms, fitting and repairing boilers, and covering all plumbing, central heating, and power flushing requirements. Our team have more than 20 years of experience and take pride in being reliable and trustworthy and completing work of the highest standard. This commitment to quality has seen us develop an enviable reputation in the local area, and 9 out of 10 of our recommendations come from current customers advising their friends and family. The tradesmen at Holloway Bathrooms always follow building regulations and are extensively qualified, holding memberships and registration with Gas Safe, BPEC, and WRAS.